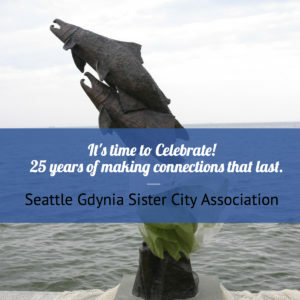 Gaze out on the Seattle skyline while mingling with special guests from Gdynia and the city of Seattle plus the Washington Business Week students. Enjoy a hearty buffet of salmon and chicken plus dessert followed by a short presentation and recognition awards. Cost is $50 per person. Proceeds will benefit SGSCA. We’ve still got time. Please RSVP zbigkonofalski@frontier.com by July 15th.